Host4Porn Review 2019: Is Host4Porn a Good Hosting? Host4Porn doesn’t discriminate if you need hosting for your (or your clients’) adult content on a range of hosting types, such as shared, VPS, reseller or dedicated server hosting. Host4Porn is a white label IT solutions company based out of Hackensack, New Jersey. With a slogan like “if it’s legal, it’s allowed,” many customers who are in a sensitive line of business and have trouble finding hosting elsewhere will be able to host their content at Host4Porn. They aim to provide a transparent hosting service with reliable performance and great customer support. 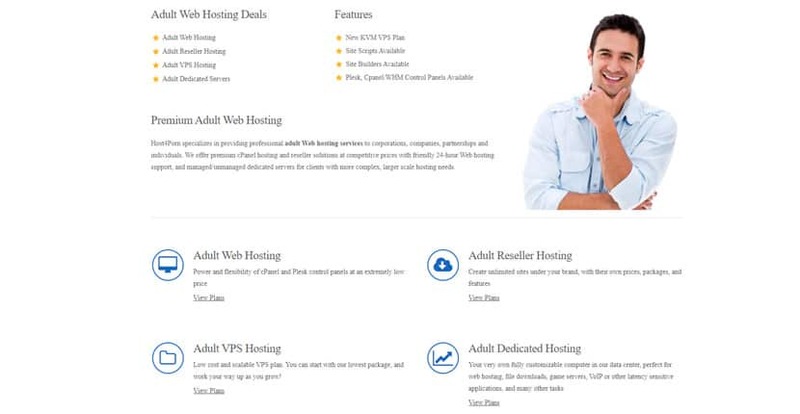 Among their products are all the most common types of hosting, such as shared web hosting, VPS hosting, and dedicated servers to cater to all types of businesses. High-End Servers: Host4Porn’s servers have a number of fantastic features, such as RAID 10 disk arrays, 99.99% uptime guarantee, and a few SSD storage plans. cPanel or WHM: This combo is the most powerful and popular hosting control panel software out there. Website Builder: Their website builder isn’t included with their cheapest plan, the Adult Essential Plan, but is a great and easy-to-use tool with which beginners can quickly launch their websites. This includes numerous professionally-designed templates. Signing up with Host4Porn is extremely straightforward. Upsells are limited to choosing your billing term and adding a dedicated IP. With the cPanel and WHM control panel, you will also have a familiar and superb platform to manage your hosting. If you go with any of their more expensive shared hosting plans, their website builder will be pre-installed for you so you can immediately jump into building your website. With other plans, you’ll get a more barebones setup, so you’ll need more technical expertise to manage your account. Shared Hosting: Only monthly or annual billing is available. The Advanced and Pro plans come with a free domain. Essential Plan: 20 GB storage, 30 GB transfer, and five email accounts. Advanced Plan: 100 GB storage, 350 GB transfer, and 50 email accounts. Pro Plan: 200 GB storage, 650 GB transfer, and unmetered access to everything else. Reseller Hosting: Monthly, quarterly, half-yearly, yearly, biennial, and triennial billing options are available. Users get unmetered access to everything except storage, data transfer, and number of domains hosted per account. Essential Plan: 50 GB storage, 250 GB data transfer, and up to 25 domains. Advanced Plan: 70 GB storage, 350 GB transfer, and up to 50 domains. Pro Plan: 90 GB storage, 450 GB transfer, and up to 100 domains. Deluxe Plan: 120 GB storage, 600 GB transfer, and unlimited domains. VPS Hosting: These are KVM-virtualized setups with monthly, quarterly, half-yearly, or yearly billing. Essential: Two CPU cores, 3 GB RAM, 40 GB SSD storage, and 6 TB bandwidth. Advanced: Four CPU cores, 8 GB RAM, 80 GB SSD storage, and 8 TB bandwidth. Pro: Six CPU cores, 16 GB RAM, 180 GB SSD storage, and 10 TB bandwidth. Deluxe: Eight CPU cores, 32 GB RAM, 350 GB SSD storage, and 20 TB bandwidth. Host4Porn offers 24/7/365 technical support with all of their hosting services. Unfortunately, they only provide support through tickets, but their support staff are amazing and always seem to reply to your queries quickly while offering expert advice. It’s very hard to find a negative support experience from any other users as well. Plus, they actively maintain their social media accounts and blog to keep their customers in the loop and to provide help articles and tutorials. Host4Porn proves that you can run a reputable, reliable, and high-quality hosting service while catering to clients who operate in niches that might struggle to find hosting elsewhere. The way they do business is professional and honest and they provide great (if limited) support. Wondering how Host4Porn stacks up against other Web Hosting companies? Enter any other Web Hosting company and we will give you a side-by-side comparison.